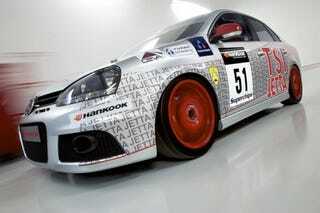 Volkswagen today launched their new Jetta TSI Sports racer for the UK Volkswagen Racing Cup. Featuring both super- and turbocharging, this saloon should be both faster and more reliable than LaDainian Tomlinson. The addition of the engine-driven supercharger and exhaust gas-powered turbo should provide motivation down low and up high, boosting power to 230 horsepower, an increase of 60 horsepower over the previous incarnation. In addition to racing goodies, the Jetta also gets a sleek paint job. For those with braille readers, the paint says: JETTA, JETTA, JETTA, JETTA, JETTA, JETTA, JETTA, JETTA, JETTA, JETTA, JETTA, JETTA, JETTA, JETTA, JETTA, JETTA, JETTA, JETTA, JETTA, JETTA, JETTA, JETTA, JETTA, JETTA, JETTA, JETTA, JETTA, JETTA, JETTA, JETTA. Press release below the jump. Volkswagen's latest track challenger, a supercharged and turbocharged Jetta saloon, was unveiled today (Thursday) in Britain. The Jetta TSI Sport made its debut at the Autosport International racing car show at Birmingham's NEC, taking centre stage on the British Racing and Sports Car Club stand. The new machine will take to the track for the first time on Easter Monday (24 March) in the opening round of the Hankook-backed Volkswagen Racing Cup, at Oulton Park. In road-going form the Jetta's 1.4-litre, 16-valve engine produces 170 PS but the engineers at Volkswagen Racing UK, with the help of their technology partners at Superchips, Milltek Sport and Turbo Dynamics, have boosted this to 230 PS. The TSI features an engine-driven supercharger and an exhaust gas powered turbocharger, arranged in series; the supercharger operates at lower engine speeds and the turbo cuts in as revs rise. The result is excellent driveability and performance throughout the rev range, with no turbo lag and high maximum torque. It's not only in Britain that the Jetta will be cutting a dash this season - the Sports Car Club of America is to stage a championship for turbodiesel-powered machines. The Jetta TDI Cup will launch in May. In the UK, the Jetta TSI Sport will be raced by selected motoring and motor sport journalists. The Volkswagen Racing Cup expands to 14 rounds this year and will once again be the chief saloon-race support to the British Formula 3 and British GT Championships. The Volkswagen Racing Cup in association with Hankook is further supported by Augustus Martin, Castrol, ECM Vehicle Delivery, Milltek Sport, Mondial Assistance, KW Automotive, Superchips, TNT Logistics, Turbo Dynamics, Volkswagen Commercial Vehicles and Volkswagen Financial Services UK.